Intermittently, a law enforcement action blocked S.E. 17th Avenue just north of Knight Street on Monday, January 14, starting at 1:03 p.m. Some of the ten Portland Police officers at the scene were keeping an eye on the back of the property; others were talking with employees of the nearby Space Age gas station, and another person at the front door of the office there, and still others were gathering in the street. A PPB sergeant at the scene told THE BEE that they were assisting in a Warrant Service for another agency. The large black SUV parked partly in the street, around which officers were gathering, belonged to the "Special Emergency Response Team", in which tactical tools are carried. After some time, officers used a "loud-hailing" system to call out to the person – who was believed to be staying in a recreational vehicle, parked in a lot just north of the Space Age gas station and repair garage – to come outside. With no response, officers slowly approached the vehicle to make entry. Apparently, nobody was inside. And eventually, by about 4:00 p.m., all police had cleared the scene. 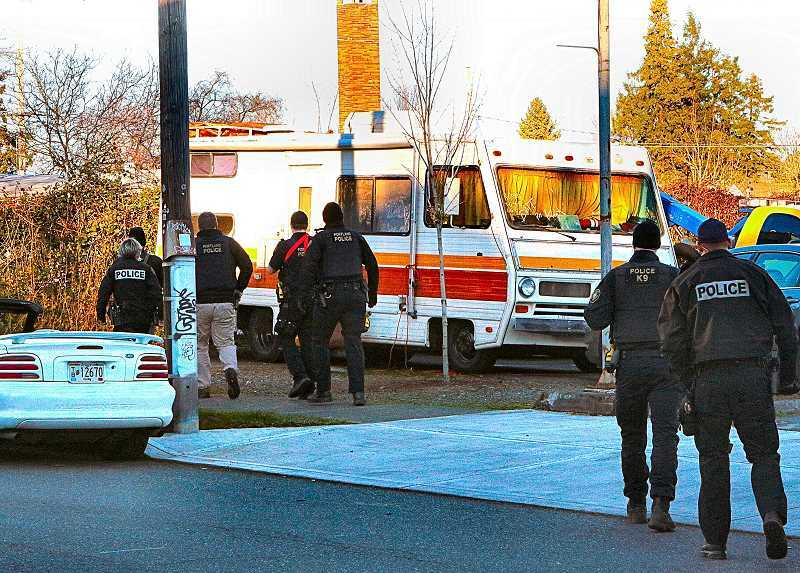 "Officers were in the area searching for a person that the Marion County Sheriff's Office had probable cause to arrest," reported Portland Police spokesperson Sergeant Brad Yakots, after the incident. "Officers cleared the scene after the search yielded nothing – but there is not believed to be a danger to the public involving that person. We have no other information."